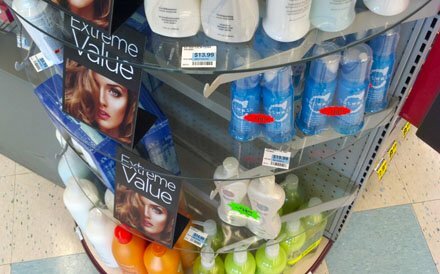 Normally you might not consider glass Endcap in many mass merchandising segments of retail, but here in drug with hand-carry baskets it can be appropriate. The curved glass makes for a slightly more sophisticated display than the sterile aisles of ordinary gondola. 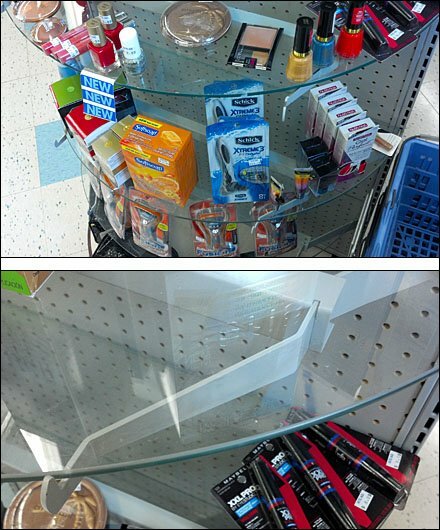 And with no metal shopping carts to crash into it, the tempered glass is safe and sound. I found the metal supports a bit complicated, but you are a better judge than I. CLICK the thumbnail for another view.